Though credited with inventing the “opera-ballet” and known primarily today for his numerous spirited stage productions, the remarkably prolific French Baroque composer André Campra was equally famous in his time as a church musician, penning (as of last count) no fewer than 60 “petits motets” and 51 “grands motets” (ones scored for full orchestra, choir, and soloists). 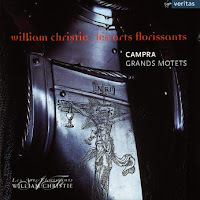 In 1993 Les Arts Florissants director William Christie (performing on organ) shared continuo roles with viola da gambist Anna-Marie Lasla (who returns here), supporting soprano Jacqueline Nicolas in a lovely and highly acclaimed program of six of Campra’s petit motets for the Pierre Verany label. Now with much more Campra under his belt (including the premiere recording of Idomeneo, one of his most famous operas) Christie here offers an equally stunning program conducting three of Campra’s grand motets as well as a choral fragment–the Introit from his Requiem.Given how active Campra was as an opera composer it’s not surprising that equally rich gestural and melodic elements are often heard in these motets. For instance, the fifth movement of Notus in Judea Deus (In Judah is God known) features a highly dramatic bass duet powerfully rendered here by Andrew Foster-Williams and Arnaud Marzorati. Heightened by Christie’s crisper, more urgent articulation (particularly from the strings) Les Arts Florissants now marginally outclasses my long-standing reference recording–Herve Niquet and Le Concert Spirituel’s otherwise fine performance on Adda. (Enthusiastic listeners new to Campra would do well to seek out all three unfortunately deleted volumes Niquet devoted to the composer, featuring two extraordinary soloists–the youthful Veronique Gens and countertenor extraordinaire Jean-Paul Fouchécourt.) Equally exuberant is baritone Nicolas Rivenq’s opening aria to Exaudiat te Dominus (May the Lord hear thee), the program’s most consistently upbeat motet. Preceded by an orchestral pomp and fanfare worthy of Handel, Rivenq’s proclamations, though short, are stunning–as are the rousing choral, brass, and percussion forces that follow.Christie concludes the program with the Introit movement of Campra’s well-tended Requiem–Herreweghe (Harmonia Mundi), Gardiner (Erato), and again Niquet all claim remarkably lucid, impassioned performances on disc. Though Christie favors a slightly slower tempo than all three, like Herreweghe he places primary emphasis on the movement’s rhythmic structure, heightening its sense of grandeur and solemn nobility. If Christie’s intention here was to whet our appetites for a complete performance of the piece, he has succeeded. Virgin’s sound is excellent–spacious and slightly reverberant while preserving instrumental and vocal detail. This is a very rewarding release and highly recommended, especially to those unfamiliar with this unjustifiably neglected composer. A warm welcome to all fellow classical music enthusiasts.The purpose of my blogs is two-fold...to give back to the community who has helped me so much over the years and provide info to my radio listeners. Thank you both and thank you 1.FM for your continued support. All of the cd's you find here are the latest additions to the web radio and are broadcast or will be in the near future. I want to encourage every visitor to buy the cd's and support the artists. Thank you for visiting my blog and please listen to my radio whilst browsing. Contributions and suggestions/opinions are most welcome. Happy listening! Please visit my other blog too..
Not a member of FileFactory? Use free JDownloader. 10% off the normal price!! Vivaldi & Pergolesi - Magnificat, Nisi Dominus - Hogwood, Preston et.al. Telemann - Quatuors Parisiens Vols 2&3 - Holloway, Duftschmid, et al. ottomusick.com. Watermark theme. Powered by Blogger.